JAY-Z's new album 4:44 has officially been declared a hit after going platinum in five days. The project debuted exclusively on the rap icon's Tidal streaming service on 30 June (17), and fans rushed to listen to the confessional songs, in which the typically-private star addressed his troubled relationship with Kanye West, revealed his mother is a lesbian, and publicly apologised to his wife Beyonce for his womanising ways. Physical copies of the album have yet to go on sale, but 4:44 has already been certified platinum by officials at the Recording Industry Association of America (RIAA). The milestone means the material has either sold or been streamed one million times. It's the hip-hop veteran's 17th platinum plaque for an album, and his 13th for a solo release, according to Pitchfork.com. JAY-Z previously inspired RIAA bosses to adjust their requirements for the gold and platinum certifications to reflect the popularity of digital sales prior to the release of his 2013 album, Magna Carta Holy Grail. At the time, an album could only be given the top certifications if it had been out for at least 30 days, but that rule was amended after it was announced the MC had struck a deal with Samsung officials to purchase one million units of the project to give away for free to their Galaxy cell phone customers. 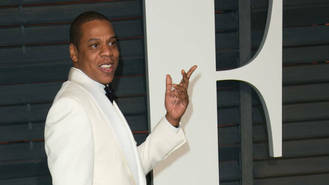 The change in the RIAA policy, allowing officials to count digital album sales immediately upon release, meant Magna Carta Holy Grail went platinum on its launch day. This time around, 4:44 was also made available for free to customers of U.S. mobile network Sprint, while the album benefitted from the streaming of individual album tracks counting towards equivalent sales, as per the RIAA's 2016 policy update. Mumford & Sons have returned to the "mentality" of their early days for their new album. Ella Eyre wants to write for Nicki Minaj and Justin Bieber. Chas and Dave are going to record a new album now Chas Hodges has got past his cancer battle. Taylor Swift and Calvin Harris are reportedly “cooling things off” after an intense few months together. Pop star Selena Gomez was inspired by Taylor Swift to let more people into her life. The Killers have announced a huge UK tour. Eminem says 50 Cent's rap from '8 Mile' made him want to quit rapping. TLC are rewarding Katy Perry with a slumber party after she donated $6,500 to their Kickstarter campaign for their album. Dua Lipa and Martin Garrix are working on a new song together.